Authors: Ricardo Chavez, Elena Terlevich, Roberto Terlevich, Manolis Plionis, Fabio Bresolin, Spires Basilakos, and Jorge Melnick. In 1929, astronomer Edwin Hubble discovered that the universe is expanding. He made this discovery by noticing a relation between the distance of a galaxy (d) and the speed at which it moves away from us (v), and wrote this relation as his famous Hubble’s Law: v = H0d, were H0 is the ‘Hubble constant’.It might surprise you that the constant in that equation, H0 is still not very well constrained! The problem is that measuring distances to objects is observationally very difficult. While velocities are very easy to measure using redshifted spectral features, measuring distances—a seemingly simple task!—provides a challenge. We can measure distances to nearby stars using parallax (observed motion with respect to background stars), but parallax only works for relatively nearby stars. Beyond those, we need ‘standard candles.’ Standard candles are objects that have a known intrinsic luminosity. Because we know that the flux we see will decrease as the square of the distance to the object, we can use the flux observed from the standard candle to measure the distance. Traditionally, Type Ia supernovae, which result from the explosion of a white dwarf, have been used as such standard candles. (See this post for a discussion of some of the details and challenges of this technique). These supernovae are extremely bright and can be seen at high redshifts, so we can use them to measure cosmological distances. This technique has given us a fairly precise, direct measurement of H0, of 73.8 ± 2.4 km/s/Mpc. This paper demonstrates that a completely different type of object can be used as a standard candle. This approach is incredibly powerful, because if it works, it could provide a completely independent constraint on the expansion rate of the universe! HII regions are the big clouds of ionized gas where stars are born. HII galaxies (see the astrobites Galaxy glossary) are galaxies whose spectra are dominated by a giant HII region. This picture shows the HII region in the Orion Nebula. The optical image on the left shows clouds of gas and dust; the infrared image on the right shows newly born stars. The authors find by measuring nearby (but extragalactic) HII regions with known distances that there is a strong correlation between the width of the dominant spectral feature H-β and the total luminosity of that feature. 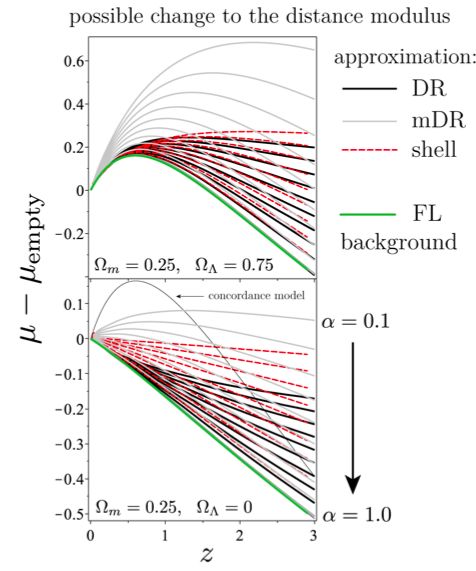 They fit a line to that correlation, which gives them a way to measure the total intrinsic luminosity given the width of the spectral feature. Then they measure a large sample of much further away HII galaxies, up to a redshift of 0.16. Using the equation determined using the local HII regions, they can figure out the intrinsic luminosities using the width of the line. Then, using the actual measured flux, they calculate the distance to the object. 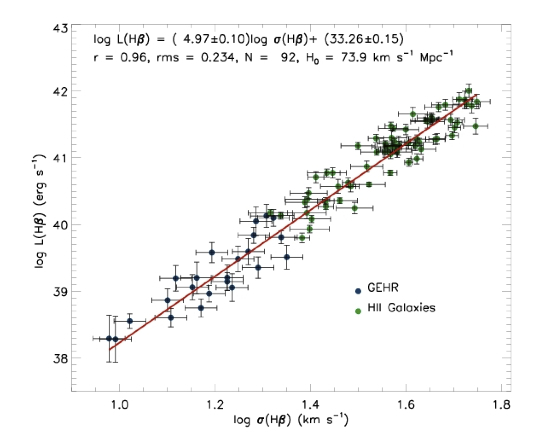 Figure 2 from the paper shows all of the local HII regions (GEHR on the plot) and the distant HII Galaxies. The width of the line (sigma) is plotted on the x axis and the total luminosity of the line is plotted on the y axis. This method provides a set of distances which can then be combined with velocity measurements to measure Hubble’s constant. Hubble’s constant is found to be 73.9 ±2.7 (random errors) ±2.9 (systematic errors). The error bars are almost as small as the traditional Type Ia supernova method, and this new method is completely independent! This new constraint of Hubble’s constant gives us an independent confirmation of the rate of expansion of the universe. Are supernovae really so super? Inhomogeneities and the accuracy of distance measurements A New Galactic Yardstick A Trio of Supernova Fossils Cosmology Results from The Dark Energy Survey!